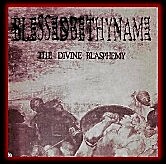 True to its title, The Divine Blasphemy is a CD that conjures up images of ancient indiscretions, where the lines become blurred between good and evil. The first track on the album, "Scripture" starts in with a tribal drumbeat that leads into a quote from Jesus of Nazareth before unleashing the voice of front man Eddie Kelly onto the battlefield. Kelly's voice is a mix between Dani Filth (Cradle of Filth), Marilyn Manson and something slightly serpentine. His voice is both guttural and melodic. This leaves me with the distinct impression that I am not listening to a new sound or album, but rather something that is ancient and that has been re-awoken with the romantic notion of destroying everything in sight and rebuilding it. "Hailing the Failing" throws bone-crunching guitar with pounding drums and unrelenting bass to give an almost militant feel. You won't find better lyrics from Skinny Puppy, or :wumpscut: either. "All of us I have chosen / all of us I have spoken / all of us interwoven / I am the all of everything / leads back to me". Try finding that sense of unity anywhere else. The crowning victory of this album is "Myriad" an epic that starts and ends like a Dead Can Dance song would aspire to. "Myriad" is laced so tight with emotional angst and release that it becomes necessary to reveal these emotions dancing inside you also. Ultimately, that is what this album is all about; Teaching your inner self to dance, to cry, to sing, and bash some heads in while you're at it.